You think you don't need image-stabilized binoculars? Think again. Just about all of us carry binoculars on our boats. But just about all of us carry the wrong type. 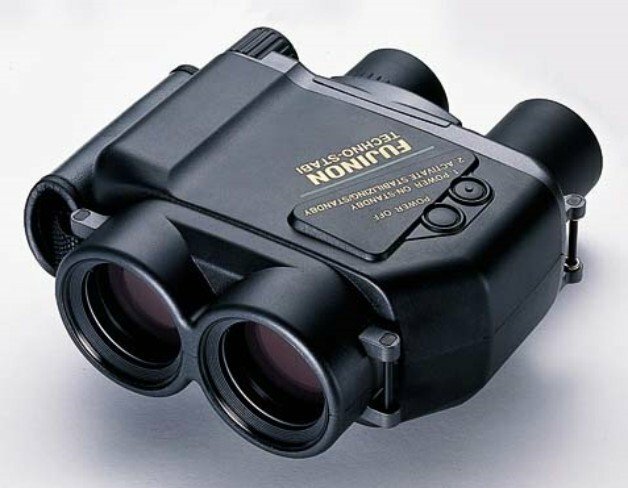 Regular marine binoculars, which are commonly 7X magnification, are dated, old technology. You think you don’t need image-stabilized binoculars? Think again. Back when discussing Under-Rated Boat Gear You Need I mentioned image-stabilized binoculars. But these are so helpful, the deserve more discussion. I have a pair of Fujinon image-stabilized binocs on my own boat, and right behind the fishfinder, they’re my number-two most important fish-finding tool. Here’s why: anything stronger than those vintage 7X marine binoculars can’t be used aboard a boat, because even in calm seas the boat moves too much for you to focus in on anything. With image-stabilization, however, you can have a magnification of 14X, 16X, or even more. And no matter how rough it may be, the pitching and swaying of the deck, much less hand-shake, is eliminated from the equation. In real-world use, what this means is that with your old marine binoculars, you can spot birds diving on bait from three miles, maybe four on a good day. But with these super-binocs, you can spot ’em from seven or eight miles without a problem. And, as we all know, birds diving on bait usually means a feeding frenzy lies just over the horizon. So, why doesn’t everyone have these? The answer is simple: price. Yes, they are expensive. You have to plan to spend $1,000 or more to get a good quality pair. (Quality Shopper Hint: choose models with an integrated battery compartment. Those with external battery compartments tend to let in water, and the connections get corroded). But, just how much did you spend to get your fishfinder? In all likelihood, at least that much and maybe triple the amount. Yet remember, when it comes to finding fish those image-stabilized binoculars come second only after that fishfinder. Still not convinced? Well, how about the fact that binoculars are also, to some degree, a piece of safety gear? With the gyroscopic type you’ll be able to spot things, like a person in the water, from twice the distance. You’ll be able to ID other boats, pick out creeks and cuts, spot channel markers—the list goes on and on. So when you’re thinking about what to upgrade on your boat, think about putting a good pair of gyro-binocs at the top of the list.